Observations of stellar occultation by asteroids will make significant impact in several areas of astronomy. Observations of these events by professional and amateur astronomers are extremly important since thay can provide unique information about the size of asteroids and improve their orbit elements dramatically. 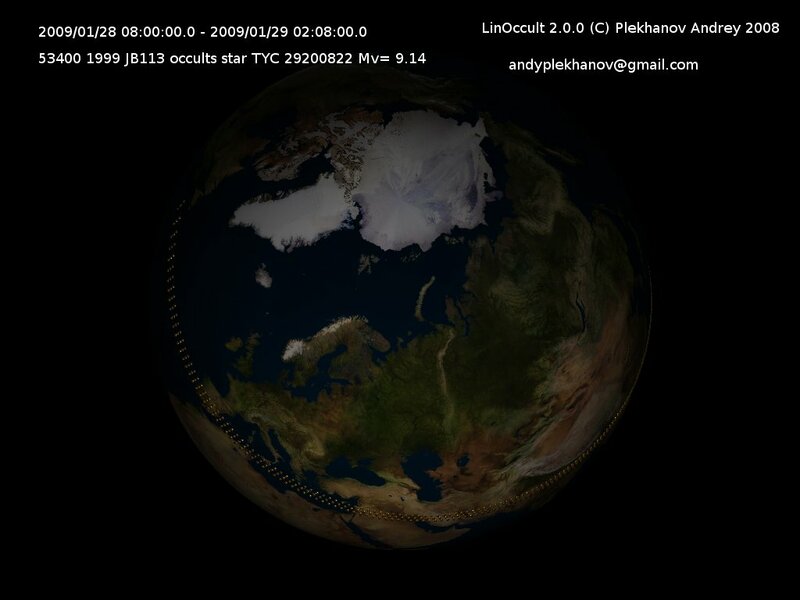 LinOccult computes predictions of such occultation of stars by asteroids. LinOccult has been developed for Linux and distributed in the hope that it will be useful, but WITHOUT ANY WARRANTY; without even the implied warranty of MERCHANTABILITY or FITNESS FOR A PARTICULAR PURPOSE. See the GNU General Public License for more details. New text and pdf output format has been developed and implemented. Using asteroid orbit elements from Steve Preston and Jan Manek updates to improve predictions accuracy. To represent calculated data in user-friendly format new HTML occultations list output was developed. Processing range of asteroids was added. Processing stars with magnitude not more than MaxMv was added. Star parallax processing was added. Star coordinates and magnitude parameters were added to configuration file. Asteroid brightness calculation procedure was corrected. All libraries and application code were updated to use "pure" C++ code with namespaces, streams and STL. Vector and matrix ariphmetics, integration and Chebyshev polynomials were moved to mathematical library. Structure of input/output library was changed. New input/output formats were added to use in OrbSearch. Two new libraries were added: APSAstroData for astronomical databases and APSAstroAlg for astronomical algorithms. Calculation of preliminary events was changed. Compilation problems in Ubuntu 8.10 were fixed. Output format for OccultWatcher was added. Bug was fixed in output to OccultWatcher. Uncertainty of star position was added to asteroid uncertainty. Migration to 64 bit platforms. Some code updates to comply with modern compilers. In kdtree float was changed to double. Gaia catalog is used instead of Tycho2. Stars position calculation was improved. DE405 - Major planets ephemeris. To create pdf output you should have a TeTeX. LinOccult use DE405 precomputed major planets ephemeris to precise numerical integration of asteroid orbit. User can select asteroids to process by changing several parameters in configuration file. To create a make files.